Love animals? Know anyone who does? If you are looking for cool toys to buy for yourself or the people in your life, take a look at all the fun, cool, cute, unique, funny and useful toys our team of writers have found for you. Take a look and DROOL! Click here to see all of our great finds and gift ideas for Animal Lovers. 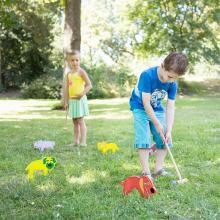 Get the kids away from the television and computer this summer with a fun game of Doggy Croquet. French Bulldogs are tremendously cute but they do require a lot of care and they have been known to snore. To make loving a Frenchie a little easier get a cute French Bulldog Plush. Don't give your favorite child just another stuffed bunny for Easter this year. 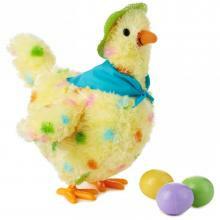 This cool Squawkin' Egg Droppin' Mama Hen goes way beyond the standard plush toy. Finding a stuffed animal for your kid to cuddle can be a tough job, especially if they are not into lions, tigers, or bears (oh, my!). 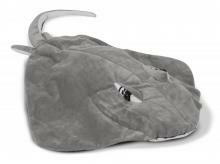 This fearsome and yet cuddly Giant Stingray Stuffed Animal may be just what you are looking for. It is a good idea to have a stuffed animal that can protect you from the things that go bump in the night. 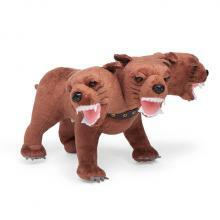 A ferocious three-headed dog comes to mind. With this fun Harry Potter Fluffy Plush you will be safe from all ghosts, ghouls, and gremlins. There truly is something for everyone — if you have enough money. 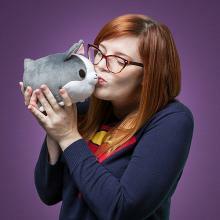 Now, pet and animal lovers can have custom-made plushies created in the likeness of their favorite feathered, furred or scaled friend.